In past years my family has participated in rice pounding – omochitsuki – at our kids’ school. It’s a tradition at the first of the year for the Japanese to take special mallets and pound the cooked rice so that it becomes a glutinous mass and can be formed into yummy balls that people roll through such treats as soy sauce and seaweed, azuki bean paste or sesame powder, and then eat. 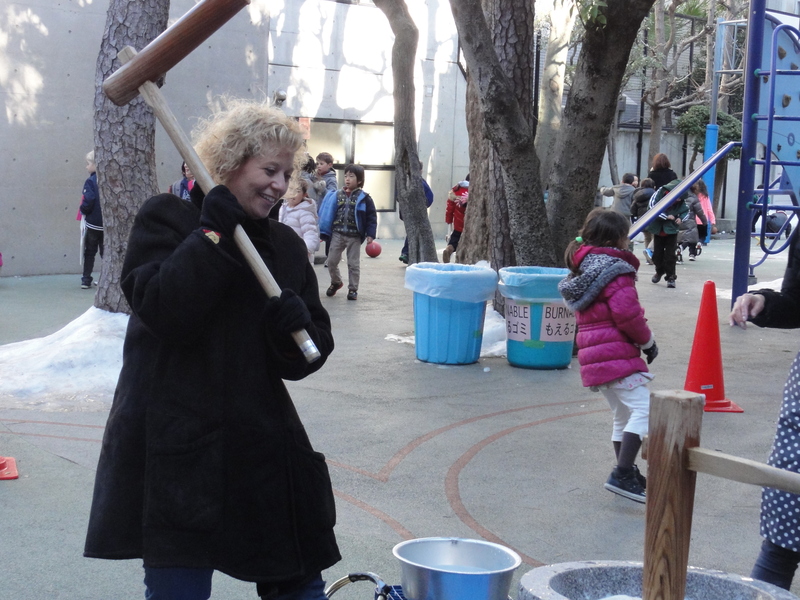 In prior years, my job has been to watch the kids and adults pounding and shout “Yoisho!” along with them – meaning something akin to a Jewish “Oy!” My husband was always the adult pounding representative from our family – I had never even taken up the mallet! This year, however, was quite different. I am the co-head of the Cross Cultural Committee at my daughter’s school, and as such, I’m nominally in charge of the day. I’m just a figure-head though; the six other committee members, beyond just cultural knowledge (most are Japanese), all have institutional memory since they’ve been doing it for years already. The preparation really began the day before with all of the rental equipment arriving and the washing and soaking of all the rice. Every last grain has to be cleaned and soaked overnight. The rental equipment included some stove-like items that boil the water to steam the rice the old-fashioned way. NO electric rice making in this operation! The old-fashioned rice steaming contraption! We had volunteers throughout the day. We needed them. While two people are pounding in the ceramic bowl, someone needs to be standing by to “flip” the rice so it gets pounded evenly. And then there were at least ten people every hour of the day who made the mochi balls and rolled them through various toppings. It was so great of people to be so ready to help out. 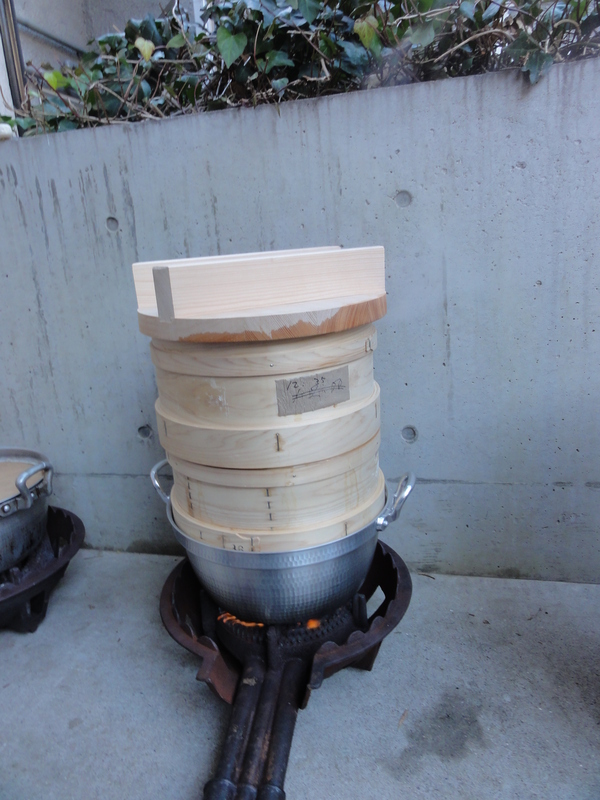 By the time the first students came to take their turn at pounding at 8:45, we were ready with rice – it had been ready at 8:30 and a few fathers had been pounding it down so it was fairly flat. The other volunteers took about half of it to make the mochi to give to the kids immediately after pounding. It was a smooth procedure – but only because the committee members and volunteers made it look that way. Next year I’ll have so much experience that I’ll be able to do it with my eyes closed. It was a privilege to be involved. ← How Do You Want To Be When You’re Old? Hi Aimee, I found your blog through Twitter, I think. Love this old-fashioned mochi-making tradition and sad our Japanese community can’t do it – you can imagine how hard it’d be to get a big, heavy pounding bowl shipped to the middle of the U.S. But, I look forward to the annual Shinnenkai at the Japanese Language School where they sell fresh mochi made in mochi-makers. And there’s always YouTube videos to watch the real thing done. Akemashite omedetou gozaimasu! It’s yummy however you can get mochi! Enjoy enjoy and thanks so much for reading.